Minister of Science, Technology, Mining and Energy, Hon. Phillip Paulwell (left), converses with Project Manager at the Wigton Windfarm, Michelle Chin Lenn (centre), and General Manager, Earl Barrett, at the grounding breaking ceremony for the 24 megawatt (MW) expansion of the wind farm complex, Wigton III. The Wigton Windfarm, established by the Government a decade ago to reduce the country’s reliance on imported oil, has been impacting positively on the environment, the economy, and the Rose Hill community of Manchester where it is located. The power generating facility, which is a subsidiary of the Petroleum Corporation of Jamaica (PCJ), has, in its 10 year existence, reduced carbon dioxide emissions by more than 562,000 tonnes. The company has also saved the country $3 billion, and has reduced oil consumption by close to 406,000 barrels. Wigton began its operations in 2004, with a mission to contribute to the diversification of Jamaica’s energy mix through the development of renewable energy sources, specifically wind energy. In 2013/14 alone, the company’s input to the national grid reduced demand for oil by almost 80,000 barrels, which resulted in savings of US$7 million on the country’s energy bill. Wigton earned some $500 million for the first nine months of the last financial year. “This is a profitable Government venture,” says Minister of Science, Technology, Mining and Energy, Hon. Phillip Paulwell. US$45 million expansion project, to be undertaken by Spanish firm, Gamesa, will bring Wigton’s total capacity to 62.7-MW, which will increase renewable energy input to the national grid by more than two per cent. 20.7MW capacity farm and, by 2010, has added another 18MW, to bring the capacity to 38.7MW. Wigton III is expected to have an output of 63,072 megawatt hours (MWh) per year and cut annul oil imports by 37,100 barrels. It will also trim some $214 million from the national oil bill, which totalled US$2.18 billion in 2013. Some 31,500 households will benefit from the project, on which work will start in April. The facility is slated to be operational in early 2016, with 125 jobs to be created during the construction phase. The project will also bolster the Government’s target of 30 per cent renewable energy by 2030, and mitigate the effects of climate change by reducing carbon dioxide emissions by 48,000 tonnes. It is also expected to grow earnings from the trade of carbon credits to heavily industrialised countries. In basic carbon credit trading, countries whose carbon emissions fall below a set allowance can sell the difference, in the form of credits, to other countries that exceed their limits. Currently, Wigton is the largest facility of its kind in the English-speaking Caribbean, and stands as an example of the sustained development that renewable energy can have on the environment. In 2010, the company established its training arm, called the Wigton Renewable Energy Resource Centre, which it is positioning to become the leading practical training facility for renewable energy professionals. Capacity improvement of the resource centre is to be undertaken as part of the expansion project. Minister Paulwell says the facility, with all its advancement, as both an energy producer and a training facility, is best suited to serve as a regional resource centre. CARICOM is looking to establish such as facility for the promotion of renewable energy in member states. 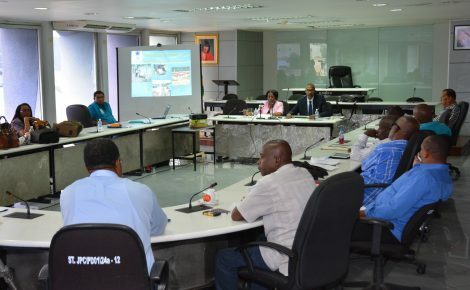 “We (CARICOM) agreed on an institution to be established, and is going to be a centre of excellence for all renewable projects in the Caribbean…Wigton should be that local institution,” Mr. Paulwell says. Adding that no other renewable energy body in the region is as advanced as Wigton, Minister Paulwell argues that the moment should not pass for “a submission to CARICOM, for the hosting” of the regional facility. “Jamaica is going to put its bid in to host this facility so that all the countries can benefit, and realise the importance of moving apace with more renewables in our mix,” he says. Wigton has the distinction of being the first Clean Development Mechanism (CMD) project in Jamaica, to be registered under the United Nations (UN) Framework Convention on Climate Change. In 2007, the company received the Jamaica Bureau of Standards’ National Quality Award for excellent demonstration of the application of standards and quality systems in production and service delivery. The Institution of Engineers’ (JIE) presented its ‘Engineering Project of the Year Award’ to Wigton phase one in 2004, and Wigton II received the honour in 2011. 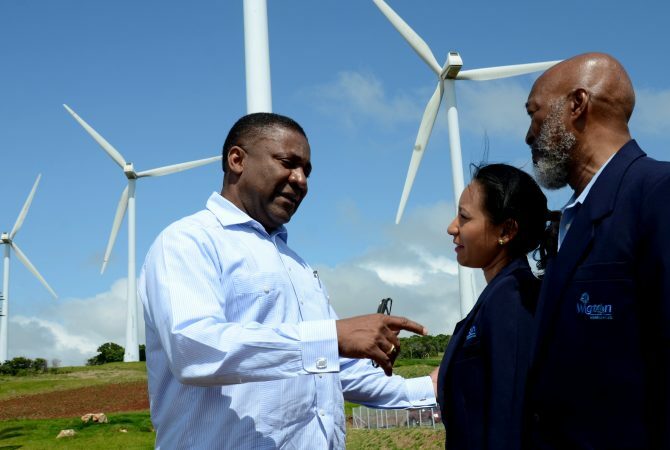 Chairman of Wigton Wind Farm, Ian Kelly, says while it has been rewarding to consistently receive recognition from local and international institutions, the company’s real impact has been on the social and economic development of Jamaica. Wigton is a major partner in the development of the Cross Keys Heath Centre, the Cross Keys Area Development Council, the Rose Hill Primary School, the Cross Keys High School, and the New Broughton Primary School. It is also enabling the livelihood of over 32 farmers, who cultivate their produce on the property. “We are big on education, because that is the foundation of any nation,” says General Manager, Earl Barrett. He says the company is proud of the work it has been doing, which entails creating clean energy, providing practical training in all facets of renewable energy, and at the same time, saving the country scarce foreign exchange. “As we create energy, which any modern economy must use, to create it from renewable energy is a fantastic benefit. On the financial side, we are…acting as a catalyst to encourage green energy as part of our life going forward,” Mr. Barrett adds.